Gum disease is found commonly all over the world and often requires expensive dental treatment. There are, however, some natural remedies that help fight its development and progress. We outline 6 of the best ones for you in this article. Gum disease is rampant around the world . It starts from something small like inflammation of the gums, also called as gingivitis, and can then progress to bone loss around the tooth, development of pickets, the recession of the gums, and even tooth loss. In most cases, the progression of the gum disease is slow, almost chronic in nature, and the damage that it causes can be irreversible . This slow progression of the disease also gives us a chance to intervene at an early moment. 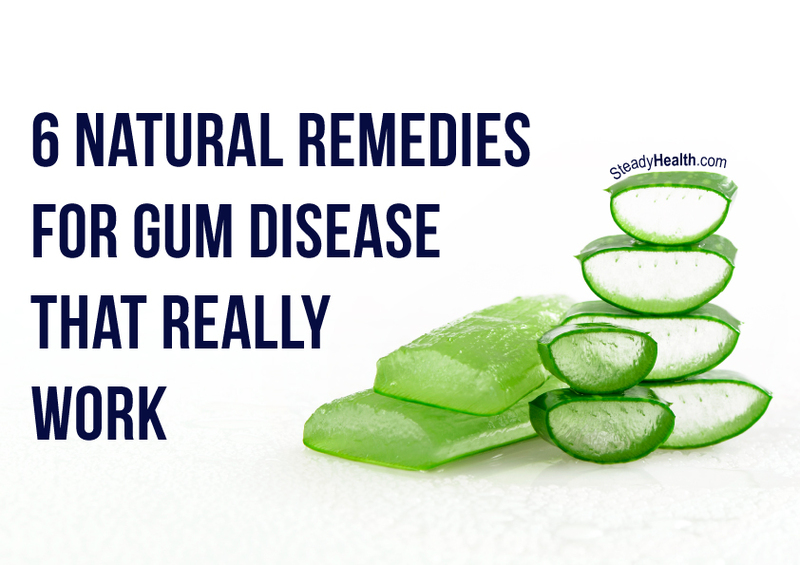 There are several natural remedies for gum disease that patients can try apart from visiting the dentist. It must be noted here that while initial gum problems such as bleeding gums treatment may be achieved through natural, at-home measures, the treatment of moderate to severe form of the disease is not possible by such methods. Let’s start with one at-home measure that works undisputedly and fights every single stage of gum disease. A lot of people wonder about the best toothpaste for gum disease and other such permutations but there is no need to. Pick a toothpaste that your dentist has recommended and brush twice a day . The physical act of brushing removes the plaque from the tooth’s surface, something that can actually be achieved even without any toothpaste as well. Flossing helps remove the plaque that gets accumulated in between the teeth, so this is again something that is highly recommended . Gum disease begins and progresses due to the accumulation of plaque on the surface of the teeth. Brushing is the only method that directly addresses that issue. Some people do not like the taste of or just do not want to use medicated mouthwashes. Some of these mouthwashes also contain alcohol which may be against certain religious principles. There are some natural alternatives for such people. Using coconut oil, peppermint oil, clove oil, or neem has been found to be effective in fighting inflammation of the gums . Neem has been used in India for dental health for several thousand years now and a number of scientific studies have recently corroborated its benefits . It is extremely rare to see a vitamin C deficiency outside of areas with extreme poverty nowadays but that does not mean that Vitamin C supplements are useless for everyone else. Vitamin C has been identified as being essential to the turnover of collagen in our body. What this means is that old collagen fibers (like the ones associated with aging and also found in the gums) are broken down and replaced by new ones with Vitamin C playing a key role in the process. Vitamin C is also a very important anti-oxidant and fights the free radicals in the body. Making the gums stronger and keeping them healthier is a direct result of the actions of Vitamin C .
Applying aloe vera gel onto the gums is one of the best natural methods for bleeding gums treatment. The aloe vera gel being used should be of a high quality and ideally come straight from the plant. It can be applied directly to the gums in an effort to combat inflammation and bring down gingivitis . People that are suffering from symptoms such as redness, swelling of the gums, bleeding and even bad odor will find that applying aloe vera gel to their gums provides them with a considerable amount of relief. Gum disease and its spread have been found to have inflammation as the underlying mechanism. In fact, one of the latest trends in the treatment of gum disease is to modulate the inflammatory response of the body to minimize the destruction that takes place. The use of a garlic turmeric paste on the gums, or green tea extracts or just including a healthy amount of green leafy vegetables in the diet will all provide the body with a good dose of anti-oxidants that will fight the inflammatory process . The garlic and turmeric paste also has some anti-bacterial properties in addition to the anti-inflammatory properties. It fights the disease-causing micro-organisms and allows the colonization of the gums by health-promoting colonies. There are plenty of chewing gums on the market which contain xylitol. For people that are especially prone to developing tooth decay or gum disease, these chewing gums can be an effective and simple measure to fight the disease-causing micro-organisms in the mouth. Xylitol is an artificial sugar that does not get metabolized by the micro-organisms in the body. This means that the disease-causing micro-organisms do not get the sugar they need for their growth. The very act of chewing Xylitol also promotes salivation that helps prevent the formation of plaque at all on the tooth surface .